New Attic Treasures showing up in Canada have three tush tags: the burgundy American, the black and white without registration number, and the temporary one that includes the registration number which is attached with a fastener similar to one that attaches the hang tag. 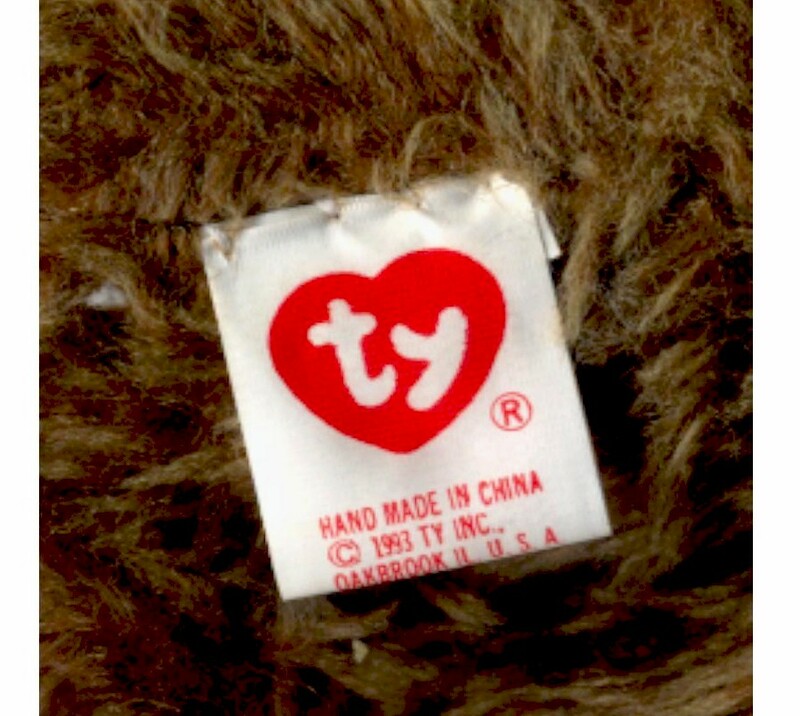 Most Attic Treasures� will have machine sewn tush tags. However, there are some Attics Treasures that have a hand tacked tush tag. We have found evidence of the older black and white tush tags being removed and replaced with a tacked tush tag. Note all the tacked tags start with a knot on the left then four lopped stitches followed by a knot on the right. Above is an example of one from a fifth generation naked Rebecca with green head bow. They have also been found on fourth generations of Digbys and Nolas, as well as fifth generations of naked Nolas with head bows. Thanks to Tim W. for providing us with a picture of the tush tag on his fourth generation Fraser. 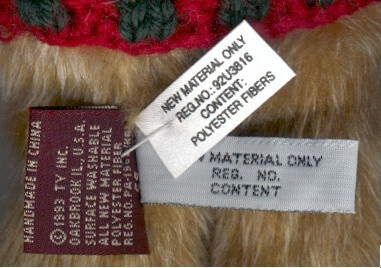 The interesting thing about this Canadian tush tag is that it is hand tacked and not machine sewn. There is a knot to the left of the tush tag, then four looped stitches on the tag, and another knot to the right, which is not noticeable. We have seen other examples of Attics with hand tacked tush tags, but this is the first report of one with a Canadian black and white tush tag; almost all of the others have had red and white tushes. 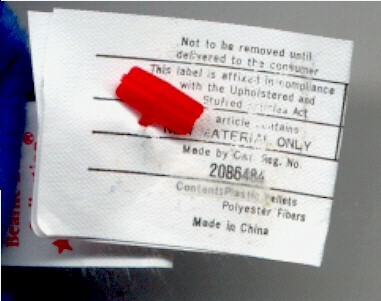 It has been theorized that Attics with hand tacked red and white tush tags may have been retagged by Ty, either at the factory or at the warehouse, replacing the older black and white tush tags with red and white ones. We cannot, however, think of any reason that a fourth generation Attic with a Canadian black and white tush tag would have been retagged with another black and white tag. One possible explanation is that the tush may have been erroneously left off when produced, and that the error may have been noticed later during a quality control inspection. 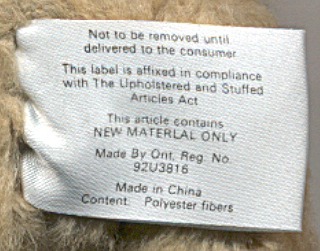 Clubbie I's had a temporary tush tag attached to meet compliance standards when shipped to Canada.